We can now officially say that winter is over. Sayonara, see you later, until next time. The Land Rover brand is notorious for off-roading excellence through all seasons: snow, ice, rain and sunshine. Winter off-roading is over in this area, and now we get to look forward to spring and summer! Windows down, sunroof open, it’s time to take your machine out for some springtime fun. Where’s your favorite place to test the power of your Land Rover or Range Rover? If you like adventure mixed with elegance, Jaguar Land Rover Peoria is the dealership for you. The exclusive Land Rover brand encompasses so many unique models that are made for your unique lifestyle. If you want to be different, if you want to stand out on the highway, we’ve got what you’re looking for. Stop in for a test drive or browse our huge selection of inventory right from your home or your phone. Don’t forget we have an obstacle course at our dealership store! Take your Land Rover of choice up the rocks to really feel what it’s like to drive the Land Rover brand we are so passionate about. Think you can’t handle it? 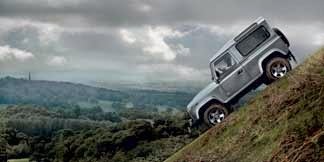 Think again—the stability and safety of a new Land Rover will make you feel more comfortable than ever. There’s no off-road experience a Land Rover can’t handle! It’s smart to know what’s under your vehicle. Having a “mental picture” of the underside of your Land Rover helps you as you cruise across new terrain you aren’t used to. Know the height of your Land Rover—comes in handy during those times you are in a low place and aren’t quite sure you can squeeze through. Before you drive up a steep hill, make sure you’re aware of what’s over the hill. Golden rule to off-roading: drive as slow as possible and as fast as necessary to ensure the safety of both you and your vehicle. Always keep a steady momentum when you’re driving through deep terrain—mud, sand, water. Looking for more off-roading tips? Click here to check out Land Rover’s official “Land Rover Guide to Off-Roading” webpage—it’s worth a read! If you have any questions about off-roading, give us a call at 309-690-6100. Our Jaguar Land Rover experts will help answer any of your on-road or off-roading needs.